Happy Saturday! Last night I didn't need to cook because we had leftovers to finish up for dinner. I finished my leftover chicken scampi-ish for lunch yesterday and then ate the other half of my calzone for dinner. Not cooking gave me the time to make my weekly Costco run after dinner last night instead of this morning. Costco is usually such a zoo on Saturdays and Sundays -- but it is a ghost town on Friday evenings (guess that isn't how most people choose to spend their Friday nights). I was hoping to find some fresh wild caught fish but all they had last night was farmed, so I passed on fish. 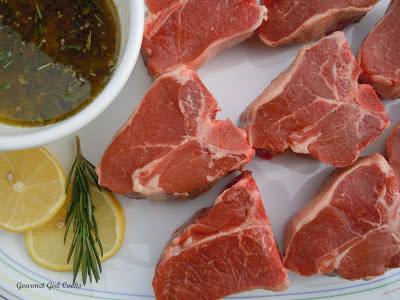 However, they did have some really beautiful loin lamb chops (they look like miniature porterhouse steaks), so I picked up a 2-lb package of them to grill for tonight's dinner. I ran a few errands this morning and picked up what I needed to make the Greek style marinade for them. I prefer to use fresh herbs if I have them and the only herb I couldn't find that looked good fresh was oregano...so I just substituted dried oregano instead. 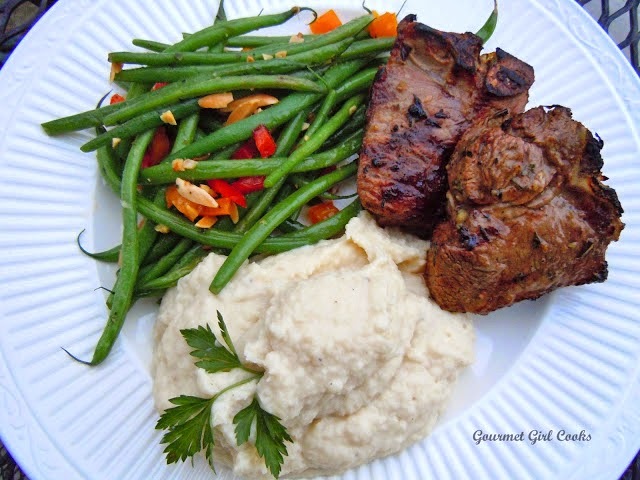 I marinated my lamb chops for about 4 hours. This marinade intentionally does not have a lot of volume -- basically just enough to coat the chops with the herbs, lemon and garlic and not have them swimming in it. 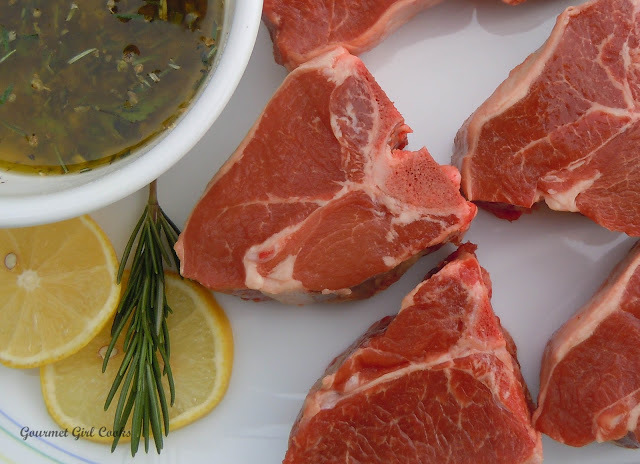 Lamb chops are usually very tender and don't need a lot of acidity or tenderizing. I like to marinate them before grilling to give them a punch of flavor. I used fresh rosemary, Italian parsley, dried oregano, black pepper, sea salt, fresh lemon juice and lemon zest and...garlic, of course -- 4 cloves!!! If you don't care for lamb, you could also use this marinade for chicken too (either boneless or on the bone). 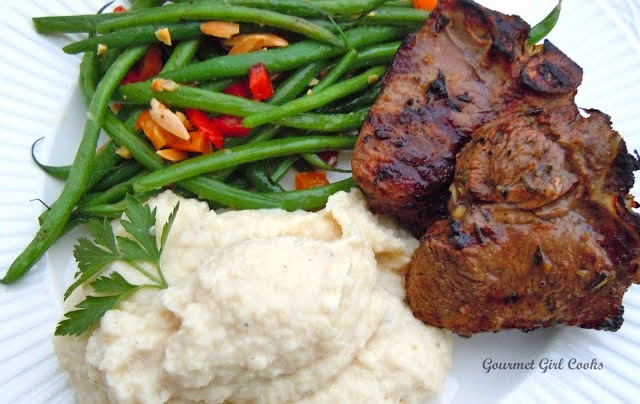 I am going to make my Rich & Thick Parmesan Mash to go with them with some fresh green beans that I also picked up at Costco last night (the haricots verts french beans). I love those beans -- they are thin, crisp and fresh. The lamb chops were unusually beautiful so I snapped a picture for you to see them before I placed them in the marinade. 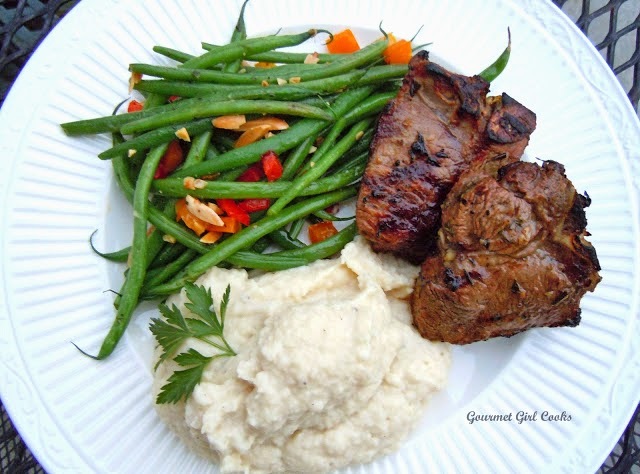 I also snapped a few photos of the finished meal for you to see as well as my marinade recipe. Enjoy! Mix all ingredients together in a small bowl. 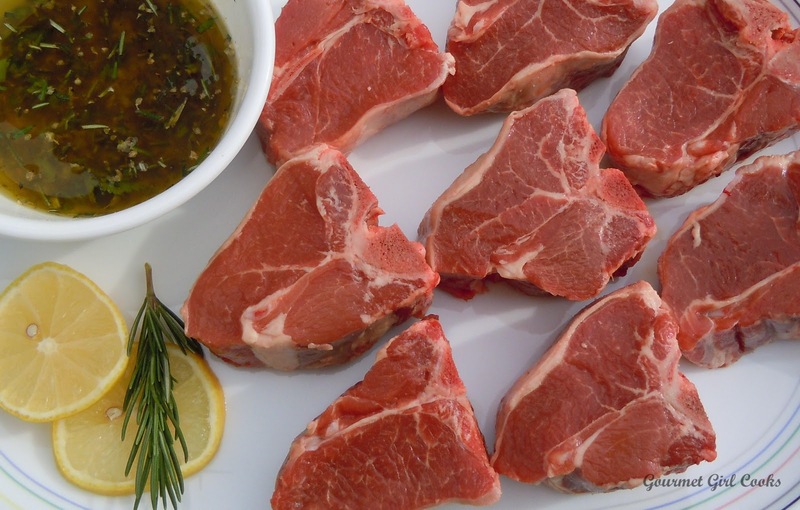 Place lamb chops (or chicken) in a gallon sized Ziploc bag and pour marinade over them. Close bag, removing as much air as possible. Marinate in the refirgerator about 4 hours or longer, if desired. Grill to desired doneness. (1)Do I multiply your recipe times (2)Cyber Sis: For how long did you broil your chops? I imagine is kind of hard to put a thermometer on such small portions :)? We've had these broiled in the oven and cooked outside on the BBQ grill. My hubby usually handles the broiling of meat. He really can't say how long he cooks them ... he just cooks them till they're done. Not much help, eh? You want lamb a little pink inside. He suggested "practicing" with a couple of chops if you have the time before your dinner party. Start with maybe 5 min. a side, then make a small cut in the center to see how they're doing. The thickness of the meat makes a difference ... the Costco chops are very thick, thicker than most, I'd say. You can't go wrong if you don't over-cook them. If I were you I'd check out GGC's suggested web site. Good luck! We are going to have these for Easter dinner tomorrow. I am looking forward to seeing all your posts and pics. Just "liked" you on facebook. I was looking for a good marinade for my rack of lamb chops…this sounds good…I'm gonna do a greek/mid east BBQ for the 4th. I've never been dissapointed with the lamb from COSTCO. I'm also making chicken shwarma and ribs.